FRANKFURT (Reuters) -- Volkswagen has cut its internal 2012 sales target slightly and by less than the 300,000 vehicles cited in a German newspaper, the company said. "Due to the continued tense market situation in western Europe, we have made slight adjustments but not nearly to the extent that is being speculated about at the moment," a VW spokesman said on Friday. German daily Handelsblatt reported that VW, which has not published a full-year sales target, had cut its expectations for full-year sales by 300,000 vehicles to 9.4 million globally. The paper cited company sources as saying VW cut its expectation for sales in Europe by 250,000 vehicles. 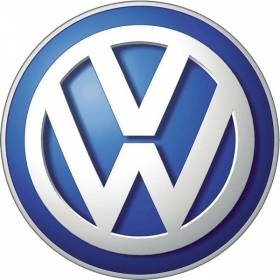 "The figures reported by Handelsblatt have no basis," the VW spokesman said. He did not give any figures for the production reduction. On Sunday the German Spiegel magazine said Volkswagen has cut its internal 2012 sales target for Western Europe by 150,000 vehicles. Morgan Stanley analyst Vikash Patel said VW may need to make small production cuts despite the company's continual market share gains to reflect the weakening environment in Europe. Volkswagen is on course to overtake U.S. rival General Motors Co. this year as the world No. 2 in car sales and aims to sell a world-leading 10 million vehicles by 2018, up from the 8.36 million recorded last year, and push past Toyota Motor Co.
Silvia Quandt analyst Albrecht Denninghoff said if a 9.4 million target reported by Handelsblatt were true, it would imply 12 percent growth and leave VW well on its way to the 10 million target. "We do not think that investors should be scared by such a small growth deceleration," he said. VW has denied a report in Automobilwoche, a sister publication of Automotive New Europe, that it was bracing for a slump in the economy and had told suppliers it was considering cutting production by 10 percent in the the autumn. Seven-month VW Group vehicle sales were up 9.1 percent to 5.19 million, helped by growth regions outside the automaker's European home market. VW Group sales in China, its largest single market, rose 17 percent to 1.51. million during the period and 30 percent to 324,200 in the United States. The company's volume in western Europe, excluding Germany, fell 5.9 percent to 1.15 million. In Germany, deliveries increased 4.4 percent to 708,100. In the second quarter through June, Volkswagen suffered a slowdown in underlying profit growth, partly because Europe's deepening debt crisis weighed on its earnings.